Snoop Dogg is one of hip-hop’s greatest treasures. He’s a legend who has been steadily releasing music since 1992, and has constantly evolved his sound, style, and persona throughout the years making him a cornerstone of American pop culture. Always one to experiment with his musical style, Snoop Dogg brings a whole new sound to the song “Vato”, the first single off his eighth studio album Tha Blue Carpet Treatment. 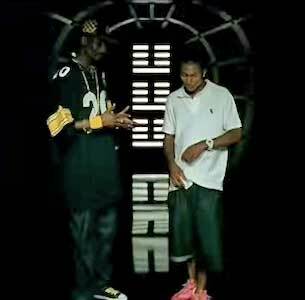 Snoop, a die-hard Pittsburgh Steelers fan, wears a Steelers jersey and matching yellow and black chucks in the video. The song features a guest verse from Hispanic rapper B-Real (of Cypress Hill fame), and was produced by beatmaking duo The Neptunes. The word “vato” is the Chicano equivalent for the word “homie”, both of which are slang for friend or confidant. Snoop uses this shared sentimentality between the words to try to confront the racial issues that exists between African Americans and Hispanics in Los Angeles. The beat is a funky mashup of Hispanic and African-American rap sounds that blends really well together, and is bolstered by the dueling verses of Snoop and B-Real. The song tries to bring together unity between the two racial groups, and does a good job of bringing unity between different sounds. The music video is set in Los Angeles, home to both B-Real and Snoop. They spend most of the video as observers of the racial tension between Blacks and Hispanics. We see fights, gang warfare, and arrests occur as these two OG’s look on. Eventually, they bring their respective cultures together in a meeting of peace and unity. This video features cameos by Chicano rapper Frost as well as Oscar-nominated, Hispanic actor Edward James Olmos. It also features a cameo from legendary producer Pharrell, one half of The Neptunes. Snoop spends the whole video wearing Pittsburgh Steelers gear, eventually rocking a pair of black and yellow chucks. This is a solid video that shows how the power of music can really bring people together. Pharrell also makes an appearance in the video. Click on the links below to get a new pair of chucks for your vato.